There is a "rooster ordinance" going before the Sacramento County Board of Supervisors tomorrow afternoon. I will be there to speak against it (time permitting). The ordinance was proposed by animal control and the sheriff's department, supposedly as a means of cracking down on cockfighting, yet they present it as a noise and public nuisance ordinance, and at the local planning meeting I went to a couple weeks ago they went into all sorts of other nonsense about human health, Avian Influenza, etc. Overall, it seems to make the rather sweeping generalization that anyone in possession of more than 5 roosters is probably using them for fighting. And yet, despite all their "concerns" about disease control, one could a limitless number of hens. Eh? 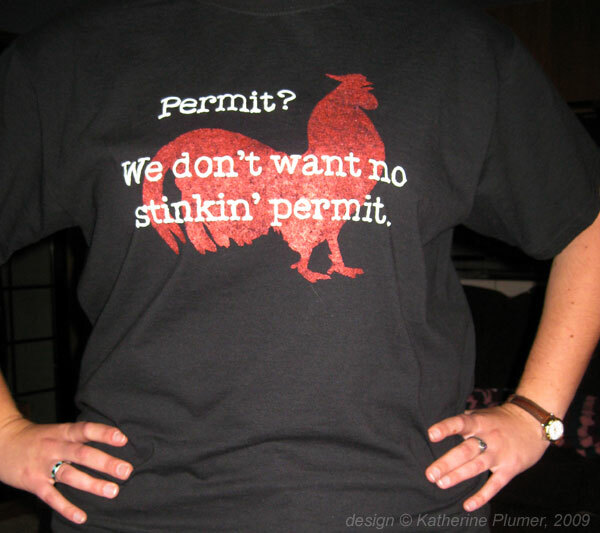 They would require people keeping five or more roosters to get a "free" permit from animal control. (How long would this be free? Not long, methinks, before a person has to pay out the nose to raise chickens). They want animal control to inspect the flock to make sure it's not a fighting flock (no way in hell am I letting a bunch of people into this BIOSECURE flock to poke around and potentially spread something they picked up elsewhere). They say they'll wear biohazard suits. (And who's gonna foot the bill for that, and the paperwork? This is supposed to save them money enforcing cockfighting? How? Oh yeah, by jacking up the permit price probably). For that matter, I don't trust some random animal control person to have any sense of what would even constitute a fighting flock. A dubbed bird? No. A bird with spurs? Um no all rooster have them (I saw this once on animal cops, the cop was like "look at these sharp spurs on his legs, clearly a fighting bird." Dude, they grow that way.) A "game bird"? Not necessarily. You can't generalize like that. Not all people raising game birds are causing problems. I can just see them going after some kid's flock of Old English bantams just because they're dubbed! Sheesh! I have been raising birds for 22 years. I have brought back colors of Rosecombs that were nearly gone, or never existed. My birds are healthy. My neighbors have no complaints. I don't want to lose the freedom to go about doing what I have been doing most of my life. I don't want to need "their" permission to raise chickens. It's ridiculous. People live in the country to get away from that sort of bureaucratic crap. You're lucky you aren't over here. Any flock over 50 birds had to be registered with DEFRA/Animal Health, regardless of if you're commercial or hobby. It's reams of paperwork, useless leaflets, the same one is sent several times a year telling me to keep my birds away from wild birds, duh they're free range, how can I do that?? Maybe I should sit out with a gun and shoot every sparrow that flies over the hedge! And to top it all they now want me to have a flu vaccination because I'm in daily contact with poultry. ewwww....that would not be good for the hobby! i agree with everything you said...and i like the shirt!